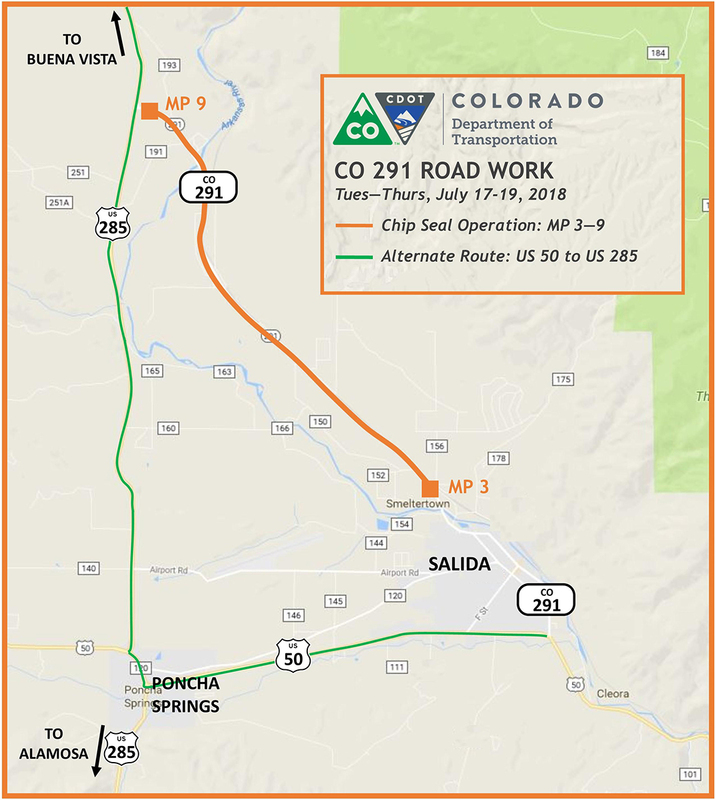 CHAFFEE COUNTY—From Tuesday, July 17 through Thursday, July 19, CDOT will treat and sweep a six-mile stretch of Colorado Highway (CO) 291 from the north side of Salida to the US Highway (US) 285 junction (mile points 3 to 9). Work hours: 6 a.m. to 7 p.m.
Expect single-lane, alternating traffic intermittently in either direction, throughout the project. Closures will be guided by flaggers and pilot cars. Expect 15- to 20-minute delays with a speed limit reduction of 40 mph through the work zone. Traffic fines in the construction zone will be doubled. Slow down. Higher speeds can cause loose stones to scatter, and damage vehicle paint and windshields. Increase distance between vehicles. Space between you and other vehicles will help reduce damage caused by loose stones. Follow work zone signage. Consider the safety of other motorists and the safety of the work crew when traveling through the project construction zone. During the three days of operation, travelers may consider the alternate route of US 50, east from Salida to Poncha Springs and US 285, north.